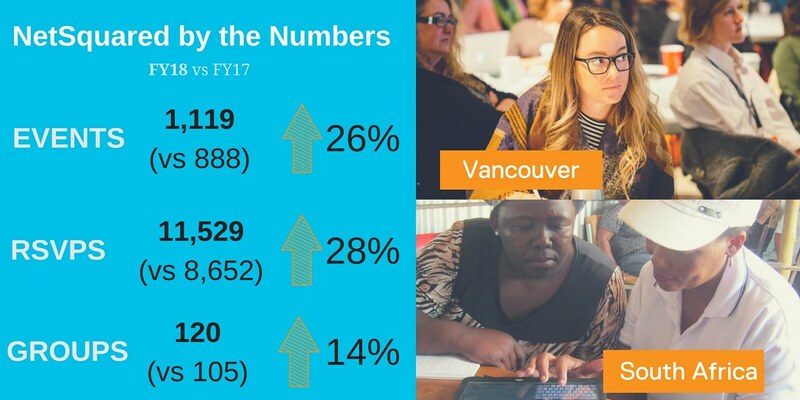 NetSquared's fiscal year begins July 1, so every summer I look back at the previous year of the community's activity to identify trends and lessons learned. This time I'll be looking at FY18, which covers July 1, 2017 to June 30, 2018. NetSquared is TechSoup’s global network of volunteer-led nonprofit technology meetups. We're the answer to the question “where can I get support to use technology effectively at my nonprofit?” Event attendees build their networks and learn practical technology skills to support their programs, marketing and fundraising. Here's all the numbers for July 1, 2017 to June 30, 20178. There are LOTS of cool things happening so you may need to scroll all the way down and click 'view entire message' to get the whole newsletter. Fall has arrived, and with it comes fundraising season. More than one-third of charitable giving happens in the last three months of the year and the emergence of Giving Tuesday (on November 28 this year) makes the year’s end even more critical for charities. Feeling overwhelmed? Your local NetSquared group is here to help with free, in-person events being held across the USA and the globe. Naples, Florida is hosting a meetup on tools for effective email fundraising; Chippewa Falls, Wisconsin is hosting a series of Giving Tuesday brainstorming sessions; and Chicago, Illinois will explore how your CRM can save end-of-year fundraising plans. With more than 75 events scheduled for October there’s probably an event scheduled for your community, so RSVP now for one of our meetups. September is HUGE for NetSquared – our community has scheduled 166 events so far and the month isn't over yet! Let's build on the momentum by making sure your group has events scheduled for October and November too.